This beautiful 5 star condo is one of the most spacious and well-appointed homes at Smugglers' Notch Resort (Named "#1 Kid-Friendly Resort in the East" again this year by SKI Magazine.) We are located directly on the slopes for true ski on / ski off convenience. Step out the back door and ski to the lifts or village. Easily return to the condo for a cozy lunch break in front of the fireplace. Enjoy a great family summer vacation here also, filled with exciting activities for kids and adults that could easily fill more than two weeks! Our condo sleeps 8, has a jacuzzi with TV in master bath, washer/dryer, gas fireplace and all the extras at the resort rated "America's #1 Resort for Family Fun" by Ski Magazine. Many area activities are available during the shoulder seasons (horseback riding, mountain climbing, hiking, golf, shopping, etc.) Perfect for leaf-peeping season and great base for fall activities in the surrounding Stowe / Burlington area. This unit can be rented by the week or by the night. This is a no smoking / no pets condo. Room, 2 Bedrooms, 2 Full Baths. Master bedroom with king size bed and ensuite master bath with large jacuzzi-style tub with TV plus full shower. Second bedroom, adjacent to second full bath, has queen bed and two twins and making it perfect for a two family vacation. Spacious Living room has comfortable queen size sleeper sectional sofa and cozy fireplace. Fully appointed kitchen with new appliances, smooth top stove, new granite counters and many extras. Excellent storage - many cabinets, drawers, and closets as well as your own conveniently-located ski /storage locker. Stereo, DVD players, and 4 TVs-large new flatscreen TVs, new front-loading washer and dryer in unit. Wireless Internet access available. Activities and attractions in Smugglers Notch, Vermont: Skiing (Alpine and Nordic), snowshoeing, skating, winter hiking, tubing, airboarding, mountain hiking, snowmobiling, dogsledding, art and cooking classes, daily and nightly activities for children, families, and adults, fireworks and torchlight parades. Summer at Smuggs is an amazing array of family, kid, and adult activities. The resort offers pools, hot tubs, skating rink, the very popular Fun Zone for kids, teen center and many other indoor and outdoor activities. In the summer there are four pool / beach complexes with waterslides, water trampoline, rock climbing, giant swing, volleyball, tennis, horseback riding, llama tours, kayaking and canoeing. New year-round Zipline Tours! Excellent location for fall sightseeing or antique shopping. Many additional activities, outstanding restaurants, golfing, Ben and Jerry's / Cabot's Cheese tours, and shopping in nearby Stowe, Burlington and Lake Champlain area. ***In order to access all of the extensive variety of activities at the resort, you must purchase a SmuggsPass directly from the resort when you check in. I will be happy to answer any questions about this for you. Not all activities are offered year-round, especially in the fall and spring. Thank you for your interest in my resort home! Fantastic family condo - amazing location! We had a terrific time! We didn't want to leave. My boys had such a great time and there were so many family activities. Cindy's tips were very helpful. The condo was the perfect setup for us. We will be back for sure. Thank you so much for your nice message! It was fun to plan your first trip to Smugglers’ with you. It sounds like you really enjoyed yourselves. We will look forward to having you back! We would absolutely stay here again. Spacious two-bedrooms and never more than a minute wait for the shuttle to anywhere. Outstanding location for skiing. Easy ski in ski out. The whole family loved it there from a 5 year old from Texas to the old guys like me. The condo has a great layout that works well for a larger group like we has. I'm so glad you chose us for your annual family ski trip! Hope to see you again. This was our first time at Smugglers Notch. I was impressed by the excellent condition and location of the condo. 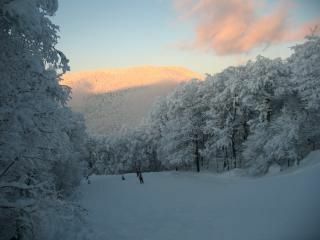 The condo is located right on the slopes, so my three children could ski directly to the ski school meetup in morning ! We also had a great view from the porch of the Thursday fireworks show. We are looking forward to coming back here next year, and hopefully this condo will be available.. Thank you so much for your kind words! I am so happy your first trip to Smugglers’ Notch was so nice and we would love to have you come back anytime! We had a wonderful time. The condo was just what we needed. Spotlessly clean, roomy, comfortable beds (amazing sheets), gas fireplace, great kitchen and ski on and off. Everything was just perfect. The kids were especially impressed with the TV in the bathroom LOL. Cynthia gave us tons of helpful information. We would love to return another year. You cannot go wrong with this condo. I'm glad you enjoyed our condo so much. We would love to have you stay again! Great Christmas Vacation with our College age kids! We stayed at this lovely condo Christmas week. Very cozy and comfortable. Great location to ski in and out! Enjoyed playing our games by the fireplace and enjoying family time with our college age twins and our sons girlfriend. Drove to Stowe, St. Albans and Burlington while we were there. Only 45 minute drive to each location. Had dinner at Hearth and Candle at resort one night and everyone enjoyed theirselves. Watched fireworks and torch parade right outside our back door! This is our families 4th trip to Smuggs and we really enjoyed this location the most!! Thank you Cynthia for such a lovely place and all your helpful information. It sounds like you had a wonderful time and made the most of your special family vacation. I'm glad all the information I sent you was so helpful. You are welcome anytime!